When it comes to getting into a vehicle that's easy to drive, has all of the latest features and can save you money on fuel, nothing beats a compact hybrid. At Team One Toyota in Rainbow City, AL, we are delighted to carry all of the latest Toyotas in stock including the 2016 Toyota Prius C. As one of Alabama's top-rated Team One Toyota has served Gadsden, Anniston, Albertville, Oxford and Jacksonville, AL for an extended period of time with an excellent array of vehicles in stock. Stop by Team One Toyota at 937 W Grand Ave. and explore the new Prius C today. The 2016 Toyota Prius C benefits from a variety of upgrades that make the compact hybrid even better. There's a new Personal Series Special Edition that features a black exterior color with Cherry Pearl or Electric Lime accents on the side-window trims, grille, outside mirror housing, inside rear-view mirror shell and headlight. Only 1,500 special edition models will be built, which make the cars extremely rare. The Prius C Three and Four models receive a new Toyota Safety Sense C (TSS-C) option that makes the compact hybrid safer than ever. With these new additions, the Prius C can be enjoyed everyday. To fulfill all of your daily needs, the new Prius C comes in four different trims to discover. With a host of models to choose from, you can get into a Prius C that fits into your driving lifestyle. The One trim has a MSRP of $19,540 and features: LED taillights, remote keyless entry, a 3.5-inch TFT multi-information display, Bluetooth Wireless technology, 15-inch steel wheels, automatic climate control, fabric-trimmed seats, Entune Audio system and more. The next trim up is the Two that starts at $20,340 and comes with: 60/40 split fold-down rear seat, cruise control, fabric-trimmed two-tone seats with chrome interior accents, soft-touch center console with armrest, cargo area tonneau cover, and more on top of the One's standard features. The Three has a MSRP of $21,765 and features: touch tracer display, a Smart Key System with push button start, Entune Premium Audio system with Navigation and App Suite and more on top of the Two's standard features. The top-of-the-line Four starts at $24,475 and features: integrated LED fog lights, heated power outside mirrors with turn signal indicators, SofTex-trimmed tilt/telescopic steering wheel, 15-inch 8-spoke alloy wheels, SofTex-Trimmed seats, heated front seats, an integrated backup camera and more on top of the Three's standard features. Unlike other compact vehicles on the road today, the new Prius C can save you a substantial amount of money every year on fuel. The Prius C comes with a fuel-efficient powertrain that can save you hundreds of dollars on fuel and provide you with a comfortable ride. The compact hybrid features a 1.5-L inline-four that is paired to an electric motor for a total output of 99 hp. The peppy powertrain is matched to an Electronically Controlled Continuously Variable Transmission (ECVT) that helps the hybrid return up to 53/46 mpg (city/hwy). With the Prius C's great fuel economy, you can enjoy driving the compact hybrid everyday and still save money on fuel. To provide you with the confidence to enjoy driving the Prius C on a regular basis, the compact hybrid is backed by a comprehensive warranty. 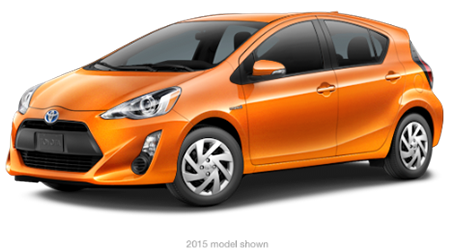 The Prius C comes with a 3-yr./36,000-mile basic warranty, 5-yr./60,000-mile powertrain warranty, and 5-yr./unlimited mile corrosion warranty. In addition to these warranties, the Prius C also comes with a lengthy hybrid warranty. The Prius C is also backed by a 8-yr./100,000-mile hybrid-related warranty that covers the HV battery, battery control module, hybrid control module and inverter with converter. If you have been searching for a compact hybrid that can provide you with a comfortable ride, can save you money on fuel every year and has all of the latest features, then check out the 2016 Toyota Prius. At Team One Toyota in Rainbow City, AL, motorists will get a great price on a new Toyota and be able to discover a vast selection of vehicles in stock. Come by Team One Toyota at 937 W Grand Ave. and test drive the Prius C today.